The Tilta Nucleus-M Wireless Lens Control System hire features a 1000′ transmission range, and comes with two lens drive motors with built-in wireless receivers. 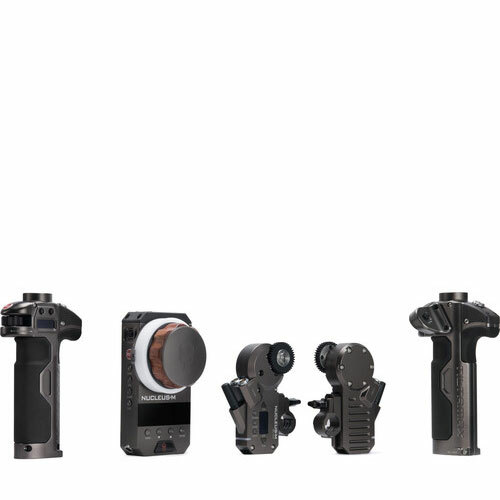 As well as a FIZ hand controller and two handgrips — one to control focus and the other iris and zoom. The lens drive motors each feature a cine standard 0.8 MOD drive gear and two 7-pin connectors, which enables you to freely swap or interchange each motor. The motors power by daisy-chaining using the 7-pin cables, and each motor includes a 19mm rod clamp with 19 to 15mm reducing bushing. The FIZ hand controller allows you to control focus, iris, and zoom, and includes a neck strap. The handgrips feature adapters that enable mounting the controllers onto ARRI-compatible rosettes or onto 25/30mm diameter rods, such as those used with gimbals. The system comes packed in a waterproof hard case that protects your gear during transport and storage. Tilta Nucleus-M Wireless Lens Control System is available for rent or hire from RENTaCAM Sydney.